I think we can all agree that the most pressing question at hand this morning is how have I made it a little over a month without reading, rereading, reviewing, or at least mentioning a book by Neil Gaiman? How?! He was my first foray into a brave new literary world back in the sixth grade when my best friend recommended I read Good Omens (Gaiman and Terry Pratchett). It’s still on my top ten list, and I’ve read it at least twelve times since then. I don’t even have the original copy I owned (a mass market paperback that was easy to hold and had my favorite cover of all the releases) because I’ve lent it out so many times (I think I might be on copy four actually). It’s a small price to pay to introduce others to an author who just keeps surprising me, and who brings a joy to storytelling that’s not just rare, it’s magical. How many people do you know who write everything from picture books to YA and Middle Grade to adult fiction, and do it well (I mean, award-winningly well)? Oh, did I mention he’s also one of the foremost graphic novelists of our time (and I say that as someone who doesn’t enjoy reading graphic novels because the combination of text and pictures hurts my eyes)? Some of his books have even been made into wonderful films and musicals. I am not overstating his talents in the least when I say he has written something for everyone and if you’ve never had the pleasure, find someone who knows your taste and have them recommend something. Seriously. Because if you don’t, or haven’t, or think he has nothing to say to you, I’m willing to go out on a limb and say you’re wrong. Not that I have strong opinions about this…I’m just saying, brilliant storytellers come along so infrequently, it would be terrible for you to miss out. Now, Odd is not my favorite, or even close to my favorite of his books, and I still love it. Also, it’s short, and between the visit from my mother and my desperate desire to finally finish watching The West Wing this weekend, I admittedly did not leave a lot of time for reading. I certainly didn’t leave enough time to give a new book the proper consideration it would deserve, so I took Odd out and spent a happy hour with him. 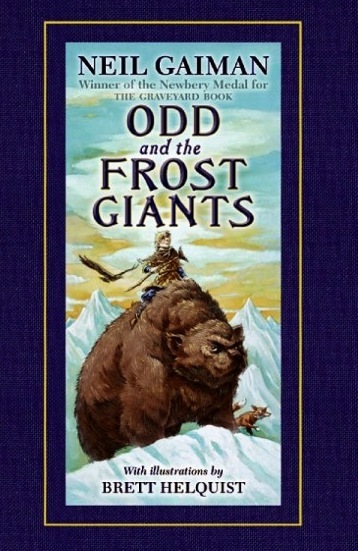 Odd and the Frost Giants is written as a Norwegian folktale, and truly, the quarter Norwegian in me can’t get enough of this sort of book (I recently read another, similarly styled excellent Norwegian tale called Icefall, by Matthew J Kirby, in case you’re into that sort of thing). It works well as a children’s story – simple, straightforward yet elegant language, and a protagonist who is both honorable and, well, odd – but it’s not a childish book. It reads like the best kind of fable, a story that will transport the reader to the icy fields of Norway, if only for a hundred or so pages. There was a boy called Odd, and there was nothing strange or unusual about that, not in that time or place. Odd meant “tip of the blade,” and it was a lucky name. Okay, if we’re going poetry this week, we’re going full-out. One of my favorite books is a little volume written in collaboration by six people – Tom Gilroy, Anna Grace, Jim McKay, Douglas A Martin, Grant Lee Philips, Rick Roth, and Michael Stipe. It’s called The Haiku Year, and it’s been the inspiration for my longest running writing experiment, a haiku journal. When I lived in LA, I was beginning to get back into writing after a hiatus of several years, and it occurred to me that I should start keeping a journal again as good practice. I had kept one for about ten years as a teenager and into college, but I fell out of the habit when I graduated. Everything I had written in those journals felt sort of cheesy though, and I couldn’t shake the feeling that I needed to censor what I wrote there in case someone should ever read it. I couldn’t bring myself to pick up that old habit again, so my roommate suggested I try writing a haiku every day for a year. He and a friend in New York had started their own haiku journals a couple of years before after reading The Haiku Year themselves. He lent me the book and I was hooked. I wrote my first haiku on Saturday, August 25, 2007, and I haven’t looked back. I recently bought my own copy of the book and decided to reread it more carefully; the first time, I tore through it in my excitement to get started on my own project, and I didn’t really allow these tiny poems to sink in. This time around, I was able to better appreciate the tones of the six different authors. The book is structured to cover a year, but the poems are not attributed to a particular writer, so the journey is (or has been for me) different on each reading. My mood, my age, my experiences as a writer – all of these things have affected how I read it. I’m not even going to include quotes from the text today because I don’t think the intricacy of the project can be conveyed well out of context. The beauty of this book is in how these writers managed to capture so many powerful and beautifully ordinary moments just by dedicating themselves to a short exercise – three lines, once a day. One of the reasons I love this book so much is that it inspired me four and a half years ago, and 1,446 days later, I’m still excited to capture a moment in my day this way. I don’t think I’ve read many books that have had such a huge impact on my life or on the way I view the world. Maybe this isn’t the book to inspire you, or your children, or your students, or your friends to start something new, but I think the idea of doing one small thing every day for a year – whatever that thing may be – could be the beginning of potentially amazing creative endeavors. And really, what’s better than a book that encourages you to court your own greatness? 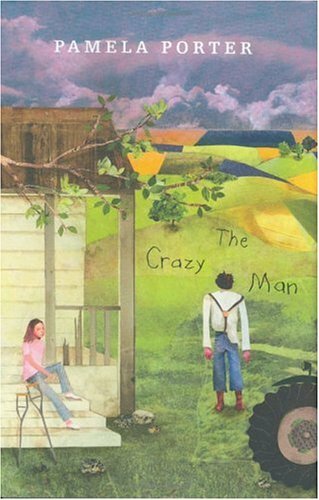 Wait, so, you’re telling me you haven’t read The Crazy Man?! I’m honestly not sure how you’ve gotten through life thus far then, because this book is a game changer. This book should be used with middle schoolers, with high schoolers, with your friends who hate to read (or for those who only “have time” to read blog articles all the live long day but couldn’t possibly finish a novel). This is a book you should read every year to remind yourself as a writer or a reader what innovation can bring to a story. This is a book that makes me love books even more than I already do, and gives me hope as the weird, un-genred writer that I am that there is a place for all kinds of storytellers. Okay, so maybe I’m just a dork, but I think Pamela Porter did an amazing thing when she took a story for a YA audience and shaped it into a novel of readable, imagination-rich verse. Yes, that’s right, poetry-haters, this is a novel-length poem, and if you don’t read it because of that, you’re the crazy one. was the best gardener they ever had. See! Easy! Nothing to be scared of here. No fancy poetic tricks (beyond Porter’s uncanny ability to turn a simple story into a delicious read). No rhyming. No degree in poetry necessary to enjoy this story. This book appeals to me on so many levels, it just makes me want to pry open every English curriculum and squeeze it in there. It’s such a great introduction to poetry for people of all ages because it’s not intimidating. The story is compelling, the characters well-drawn, the situation believable. The vocabulary is straightforward – it’s in the way she molds the language that brings the story to life. This is break down the walls because story telling should be open to every kind of voice poetry. and stuck out her hand. Introduced herself. it stayed in that day. Didn’t spill over. Years later, I still get stories rejected more often than accepted, but I’ve conquered the fear that the part of me that sees the world differently is not the best part of who I am as a writer. The thing I worry about now is all those students who don’t. Who see that red note and decide to stop trying. Or who think their unique voice is not worth hearing. This is a book for students like that, and for teachers and parents and librarians and friends who need a reminder that the story-teller inside of us should be free to experiment. To tell our stories in the very best way we can – unabashedly, and with great faith in the power of our own voice. Pamela Porter doesn’t appear to have a personal webpage, but plenty of interviews, quotes, and poems can be found on the internet. One of the worst moments of college was, for me, the first day of my Seminar in Poetry. 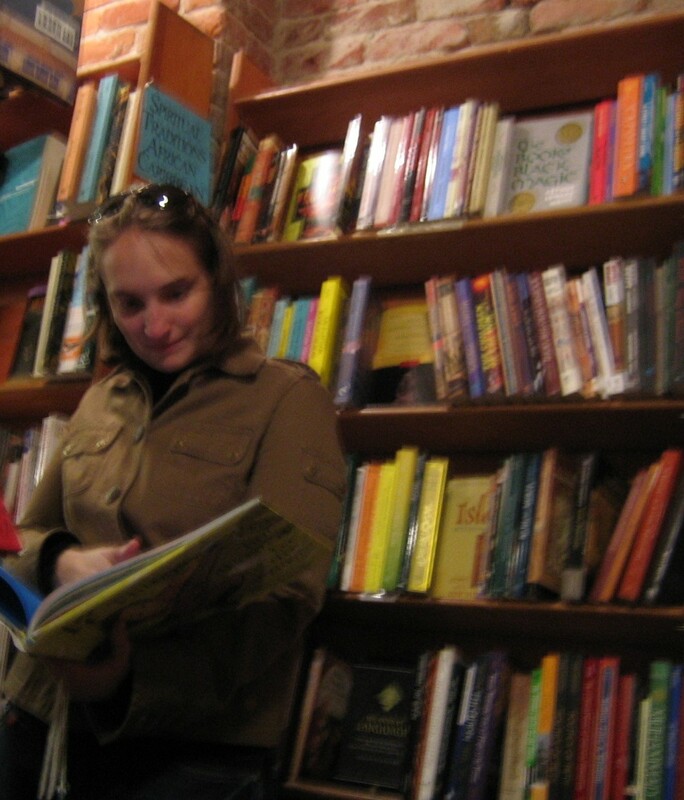 I was getting my BFA in Writing, Literature, and Publishing, and I was constantly discovering how much more seriously other students took genre. I didn’t have any interest in limiting myself to just one area of writing – I loved poetry, but I also loved screenplays, and novels, and short stories, and children’s books – and on the first day of that class, when our professor asked us to speak, not about our favorite poem, but our favorite poet, I realized I was never going to fit in with these people. I remember being mortified on that first day though, sweaty with the fear of having nothing to say. And it was as awful as I thought it would be when it was my turn (the professor never liked me and the other students didn’t respect me), but ultimately, the memory of that moment has led me to the realization that I don’t have to like books or writers the way anyone else does. One of the privileges in this country we often overlook is our right to read what we want. I think we forget it while we’re still very young – when we’re told whether we’re good readers, whether we know how to parse assignments well, whether our interests are deserving of attention. I was lucky to have been encouraged to read widely when I was young. We read together as a family, we had our own library cards, we talked about what we had read at school and at home. Books were a passion for us. One of the reasons I love to read so much YA (besides the fact that authors in that genre keep working hard to prove how incredible they are) is that I want to find the key to getting more young people to love reading as much as I did and do. One of my goals in posting here each week is to discover a wider range of material, books that might appeal to tastes a little different from mine. 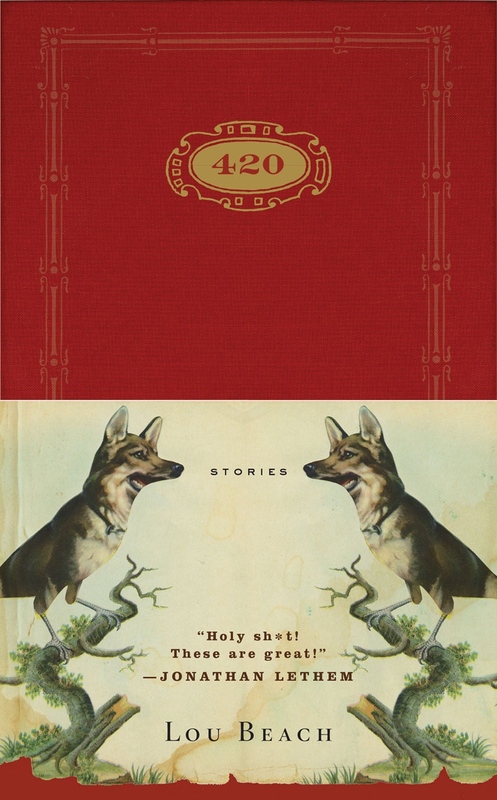 420 is one of those books. It wasn’t written for a young audience; in fact, Lou Beach is most well-known for his work in The New Yorker, Harper’s Magazine, and Time. This book, a collection of tiny stories he originally posted on Facebook (FB’s updates used to be limited to 420 characters), is his first work in prose. These stories are “populated by heartsick cowboys, random criminals, lovers, and drifters,” and it seems to me they have the potential to speak to an audience much younger than he may have intended. I really love that flash fiction and ultra short stories are starting to regain footing in popular culture. I’ve always loved them, but I know that most people associate reading short stories with high school English class rather than appreciating the genre for what it is – the perfect cure to the “I don’t have time to read” excuse. It’s fun for me to pick up his book, open it anywhere and read a paragraph like this. I can take it with me through the day, or lay in bed thinking about the little worlds he creates when I’m trying to fall asleep. Not every story is perfectly crafted – a downfall of trying to fill 170 or so pages with such tiny bites of writing – but enough of them are that I can’t wait to see what Beach works on next. Today is Monday, and I’m sorry to report that I have no book to share with you. If I had been really smart, I would have read something short on Friday, written about it, and coerced WordPress into publishing it this morning. Instead, I faffed around looking forward to the long weekend and woke up today in a panic. Could I find something to read and post about in between going to visit our dear friends’ new baby in the city and preparing (then devouring) Wafflepalooza? With my husband around to distract entertain me? One of the things I’ve discovered about this project, even just these few weeks in, is that I so desperately need two manageable books a week, everything is fair game – that book my husband picked up on a whim at the used book store, the novel my friend’s cousin recommended, a list given to me by a friend who just became a middle school librarian…now that I’ve started asking, it seems like everyone has a book they love that I have to read, and that alone makes this worthwhile. So many well-loved stories crawling out of the woodwork! It’s literary Christmas! The Ninth Ward is another recommendation from my mother; she was reviewing it for Audiophile magazine and told me the reader was so wonderful that she wasn’t sure if whether that had influenced her opinion on the story itself. 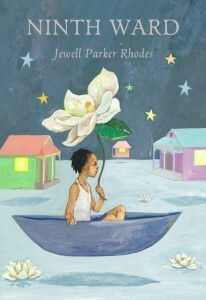 Nevertheless, this book did win the Coretta Scott King award, and it’s about Hurricane Katrina, a catastrophic event that significantly affected the first decade of the new millennium, so I decided to give it a try. Having never been to New Orleans, I don’t believe I can fully appreciate the treasure that was lost when the levees broke, but as a citizen of the world, I can’t help but be drawn to the destruction that has and can be wreaked by nature. I’m fascinated by stories that illustrate how fragile we are as human beings. This unassuming novel does just that. I felt I was walking the streets of Lanesha’s neighborhood with her, slowly being introduced into a world of subsistence living that rises above desperation and instead champions, at its darkest moment, a tenacious twelve-year-old girl. This story was so well-paced, so captivating, it allowed me to get past the fact that I didn’t love the protagonist’s voice. I doubt it would have worked in a longer novel, or with less compelling material, but I was able to gloss over certain stylistic choices that were made with the dialogue. I don’t argue that it may be realistic, even an appropriate choice, but I suspect The Ninth Ward works better as an audio book in that respect – it’s wonderful to listen to a well-rendered dialect – but reading to myself, it feels…stiff. Unnatural. My feelings partially come from the recent realization that television, movies, and the internet have largely done away with the subtler dialects in this country. The friends I have from Tennessee or Georgia or Boston or Texas may occasionally slip into local slang, but the cadence of language has largely become homogeneous. Consequently, I can believe the older characters, such as Lanesha’s adopted grandmother, might sound this way, I have a harder time believing children do. That being said, Rhodes does a wonderful job taking a recent historic event and turning it into a carefully plotted and not at all unbelievable adventure. It’s sweet and sad and frightening, a story the reader can easily imagine playing out a hundred different ways. 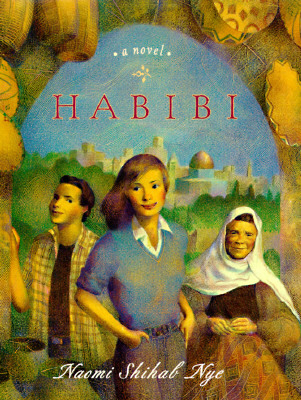 I particularly loved the development of one of the supporting characters – an odd, isolated neighbor boy who, under just the right circumstances, is able to bring to life that singular essence of friendships in childhood.